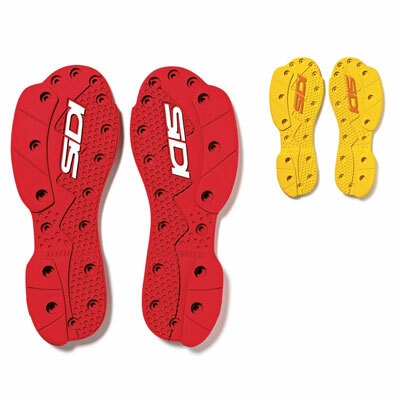 compounds that react differently depending on the track's composition and temperature With the SMS sole system Sidi does not designate Supermoto soles as “hard” or “soft”. Sidi has found from testing with its World Championship Supermoto riders that the science of picking the correct boot sole for a race event is as important as picking the correct tire. The wrong sole for the day could slide too much or grip too much. Sidi recommends that its Supermoto riders purchase both soles and test each sole at each event, just as the rider should do with his tires and gearing, ultimately selecting the best sole for the day’s conditions.